The Mariners’ group of minority owners, led by longtime Seattle tech executive John Stanton, announced the purchase of 45 percent of the club from Nintendo of America. Howard Lincoln will retire. John Stanton and 16 other minority owners have purchased a 45 percent share of the Seattle Mariners from Nintendo of America, leaving NOA with 10 percent and CEO Howard Lincoln with a retirement. At a press conference introducing Stanton Tuesday, Lincoln said he was “anxious” to retire, and that the parties agreed on a valuation of the club at $1.4 billion. All members of the group, First Avenue Entertainment LLLP, have been in the club’s ownership since the Baseball Club of Seattle bought the club from Jeff Smulyan for $100 million in 1992, so the club is calling it a transition instead of an outright sale. Stanton, a Seattle native and hugely successful tech executive with extensive interests in baseball, will assume the 76-year-old Lincoln’s duties as CEO, although none in the group will have a majority interest. The cash paid to Nintendo, which has owned 55 percent of the the club from the estate of the late Hiroshi Yamauchi, based on $1.4 billion valuation, is about $640 million. Lincoln has been with the franchise since 1992 when he was NOA’s chief corporate attorney. He played a key role in the formation of the Baseball Club of Seattle in 1992. He has been Nintendo’s representative on the club’s board of directors — he reportedly bought a small percentage of ownership — before replacing John Ellis as CEO and board chairman in 1999, a position he has held since. He resigned his NOA position in 2000 to devote full time to running the Mariners. In 2004, Yamauchi transferred ownership of the club to NOA for estate purposes, but still was involved in key baseball decisions for some time. His death in 2013 changed nothing regarding baseball operations, but Yamauchi and Lincoln were close personal friends. The Japanese billionaire, who never saw the Mariners play live, made all his decisions through Lincoln. The transition will be voted upon by MLB owners at quarterly meeting in August, and approval is expected. Stanton has been an owner since 2000, when he purchased the 10 percent owned by John McCaw of McCaw Cellular, where Stanton began his business career. Stanton was also part owner of the Sonics when Howard Schultz bought the club from Barry Ackerley in 2001. When Schultz received an offer for the Sonics in 2006, he was one of two members of the board of directors to vote against the sale. Schultz sold the Sonics for $350 million to Clay Bennett, who moved the team to Oklahoma City in 2008. During Lincoln’s tenure, the Mariners’ value has skyrocketed from $100 million (original purchase price) to more than $1 billion, according to Forbes. Also on Lincoln’s watch, the Mariners moved from the Kingdome (mid-1999) to Safeco Field, a $527 million stadium funded with $380 million in public funds after a rancorous civic debate. But Yamauchi’s purchase and the stadium funding saved major league baseball in Seattle. Although the value of the franchise has soared, the club made only two playoff appearance since Lincoln became CEO, in 2000 as a wild card in 2001, when the Mariners won an American League-record 116 games, but lost in the American League Championship Series to the Yankees. The Mariners have not been in the postseason since, the second-longest playoff drought in the four major professional sports behind the NFL’s Buffalo Bills, absent since 1999. Under Lincoln as CEO, the Mariners have posted winning records seven times in 17 seasons, but have lost 90 or more games six times, including 100+ twice, and have eight last-place division finishes. Combined under Lincoln, the Mariners are 265 games behind, an average of 15.8 per year. Lincoln has employed four general managers, who have, in turn, hired nine managers. Stanton said the board of directors and the senior executives will all remain in place, and he will stay out of involvement until the the deal closes, presumably in August. At last, and not a moment (season) too soon. So long Howard. You won’t be missed. Hallelujah! Perhaps the “curse” will begin to be lifted. 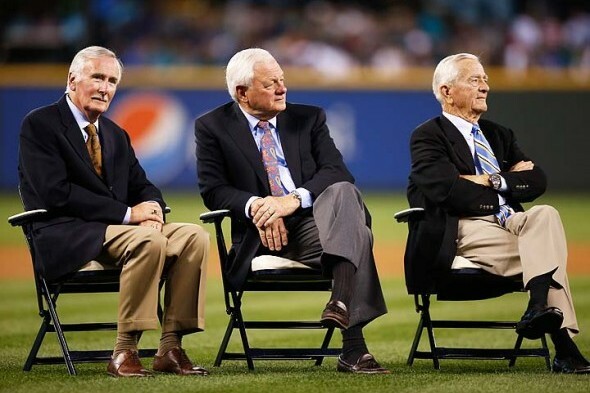 To start, I appreciate Howard being a part of the group that kept the M’s in Seattle. Were it not for them they’d be the Tampa Bay Mariners. That being said, since replacing John Ellis as the primary board member the club has had long standing frustration after closing out the Lou Pinella/Pat Gillick era with huge success. I’m not sure how much of a hand Howard had in putting Jerry and Scott in their current positions but them seem to be on the right track now. Even Eliza Doolittle needed to leave Prof. Henry Higgins (sp.?). They kept the team here, but a change was long overdue. Proof there IS a God! Our prayers have been answered at last. I will commit to buy tickets this season, as I have purposely boycotted the M’s for 7 seasons, waiting for Lincoln to GO!